The original purpose of Initial Coin Offerings (ICOs) was to take away the monopoly of fundraising from stock exchanges and brokerage firms. It is ‘relatively easy’ to set up an ICO funding round, as there is no extensive regulatory framework to abide by as opposed to launching an Initial Public Offering (IPO). ICOs often include individual investors as well as larger institutional investors. In the past, companies have emerged that pretended a blockchain-use-case in order to be able to justify the launch an ICO or financially gain by blockchain-association. ICO investors take on high-risks when investing in ICOs and they are sometimes left emptyhanded because of scam-ICOs, the inability to provide a working product or by mismanaging ICO funds. Lately, we see projects emerge that are conducting a second ICO (or STO). Investing in an ICO is highly speculative, especially in a bear market. ICO investors usually do not have (m)any rights in getting the project accountable for their actions. Recently, I received a message on LinkedIn, from a member of the Blockport team. Blockport is initiating a second ICO in the form of a Security Token Offering (STO) for a new security token, called BPS. Raising money in an STO and offering investors shares and profit sharing seems like a good thing to me, at least better than buying a token based on potential future utility, without any further rights whatsoever. What strikes me about this ‘second ICO’ is the fact that not that long ago (January 2018), Blockport launched their first ICO, in which they raised $15 million. Were these ICO investors just an easy way to generate capital, to get the project started? Or is this strategy comparable to the traditional system, where multiple funding rounds are not unusual? I have asked Blockport some questions on LinkedIn addressing my concerns, but I have not received a response yet. Blockport isn’t the only one adopting this approach. Over the previous months, we saw DeepBrainChain, Polkadot and Substratum, among others, stating they were initiating a second ICO/STO. Blockchain-based POS payment solution provider, Pundi X, initiated a vote in which community members could state whether or not the company should initiate an ICO for their new blockchain smartphone project Function X. Over 90% of the voters were against the idea of launching a ‘second’ ICO. The Pundi X team listened to the community and decided not to launch an ICO for Function X. This article intends to elaborate on blockchain-based projects that announced the launch of a second ICO. Blockport aims to create a social digital asset exchange based on a hybrid-decentralized architecture. In January of 2018, they raised the equivalent of $15 million in ETH tokens via an ICO in which they issued their utility token BPT. BPT can be used to pay for transaction fees (with a discount) on the platform, you can pay BPT to follow someone’s trading portfolio and members can earn BPT, when someone follows their trading portfolio. Recently, Blockport announced the launch of an STO, in which they intend to sell Blockport Securities (BPS). BPS token holders are given the right to receive dividends. Blockport states to be fully compliant, only not in The Netherlands, the country where the company is based. Blockport chose STO launchpad Tokeny in Luxembourg to initiate their STO. While this new STO is different in terms than their first ICO, it makes me wonder why they decided to initiate a new funding round this quickly after just having completed the previous funding round a little over a year ago. How long of a runway does the project have left? According to the website, Blockport employs 30 people and they are based in an expensive city (Amsterdam), I would assume they have a high burn rate. Did they convert their ETH raised during the ICO for fiat currency, right away? Polkadot aims to create a multi-chain network fueled by blockchain technology. In their ICO, back in November of 2017, they raised $145 million, of which $98 million worth in Ethereum (ETH) funds are permanently locked due to a Parity wallet bug. Initially, the team stated they would still finish the project without the need for the lost funds. According to the risk factors in their FAQ section on the website, it clearly states that ICO investors should calculate a risk that they lose their ICO investment. If the Genesis block will not be deployed, participants may lose their investment. Also, investors need to understand that the Web3 Foundation, might need a lot more funds to further develop and launch their project. If those funds will not be raised, investors cannot ask for a refund and they may lose their investment. Polkadot is planning another fundraising round, according to a source close to CoinDesk. 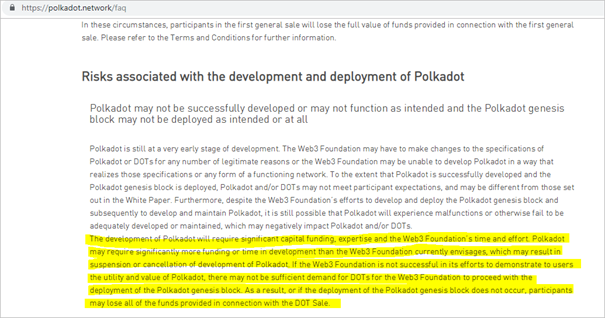 The Polkadot network is projected to launch in Q3 of 2019. Substratum aims to disrupt the centralized and controlled internet by creating a foundation for a decentralized web. According to data provided by Icodrops.com they raised almost $14 million in their ICO conducted in September of 2017. In 2018 they announced their second ICO for a decentralized exchange project called Amplify (AMPX). Initially, they received $1 million for R&D. On the 1st of October 2018, the ICO started. 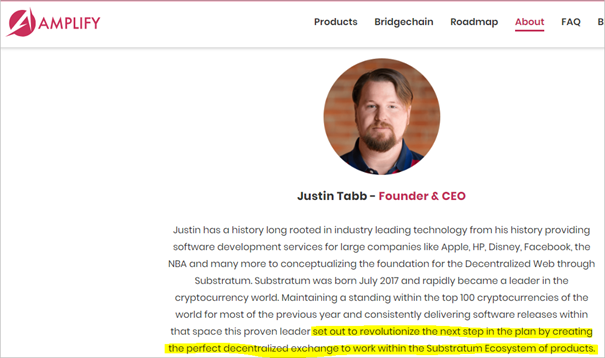 According to Substratum CEO Justin Tabb, Amplify is not a second ICO held by Substratum, but a stand-alone company. If that’s the case, then why does the Amplify website state conflicting information. 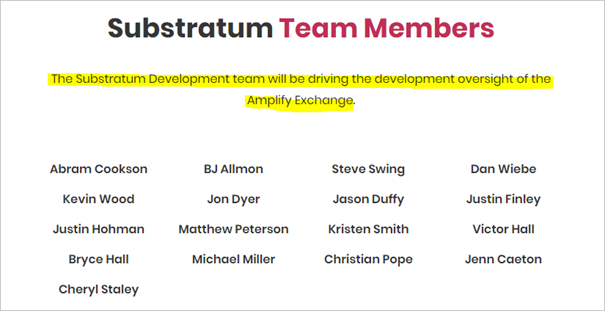 For instance, Amplify employs the same people as Substratum. It is part of the Substratum project and it will be used within the Substratum ecosystem. After listening to the Substratum community concerns on conducting an ICO for Amplify, the team decided to cancel the public sale and refund ICO participants. The private sale funds will be used to develop the decentralized exchange, that is projected to be launched somewhere in 2019. DeepBrainChain’s founders launched a new ICO and they refer to it as a separate project. DeepToken aimed to raise $5 million for 10% of the tokens. Not much information, about the actual ICO, has been made public, but the beta version of the exchange they wanted to launch is still a beta version (since September 2018) with no actual trading taking place. The interface looks exactly like the interface of Huobi, because they use Huobi Cloud services. This way they do not have to build their own asset exchange, but they can use an already existing interface. The userbase is kept separate according to the Huobi Cloud website. The token distribution of DeepToken (DPT) is postponed from before the end of 2018, to just after NYE, to who knows when. There are no details about the amount of money raised in the DPT token sale. Digital asset exchange, COSS.io launched their first ICO in which they sold COSS Tokens. COSS tokens will generate revenue based on trading fees on the digital asset exchange platform. The ICO raised the equivalent of $3 million dollars. Recently, COSS announced issuing a new token, called CFT. It is the COSS FEE token and it can be used exclusively on COSS.io for paying the exchange trading fees. COSS initiated a second ICO for these CFT tokens. According to their Reddit Q & A about the launch of CFT, the team stated they did not initiate the second ICO, because they ran out of money. As I see it, projects that were able to conduct an ICO during the ICO gold rush should be very lucky, a lot of successful projects needed to start with fewer funds. After raising millions in an ICO, based solely on a whitepaper, the best way to move forward is to start building a product. In my opinion, you should not be thinking about initiating another funding round unless you need additional funding to continue building your product. Initiating a second ICO also doesn’t bode well with a project’s supporters and investors, research shows. If the bear market has told us one thing, it is that projects should work harder, and spend less money on immaterial things. They should continue to build if they believe in blockchain technology and they want to help the industry grow towards a mature market. During 2019, and continuing into 2020, I believe we will see a lot of blockchain projects that will not make it because they ran out of funds. Aion announced near the end of 2018, they have around 18 months of runway left. One of the main Ethereum Classic development teams, announced they are shutting down, because of insufficient funds. Decentralized content platform Steem, announced late last year, they are letting go 70% of its staff to cut expenses in an effort to survive crypto winter. Making these difficult decisions and letting people go, isn’t necessarily a bad thing. Shifting or anticipating in advance can also be a very strong move in an attempt to stay afloat. Solid projects, with an innovative and achievable business idea, responsible financial management, a professional team of motivated developers have the best chances of survival. What is your opinion, do you think these project’s conducting a second ICO are doing it for the right reasons, or are they looking for alternative ways to get funding for their initial project? Disclaimer: This article is not intended as investment advice. You should always do your own research. I am not being rewarded for writing this article. All the information provided in this article is based on my own personal opinion. During these challenging market conditions, I strongly urge everyone to thoroughly research projects to potentially invest in. If you do decide you want to invest, only invest money you can afford to lose. The second ICO as a Last Resort? Or Just Another Fundraising Round? was originally published in Hacker Noon on Medium, where people are continuing the conversation by highlighting and responding to this story.